There is a whole section of Indian cuisine that very few people outside India are familiar with nor have they tasted it. Majority of the Indian restaurants in the US do not carry the food known as street food. 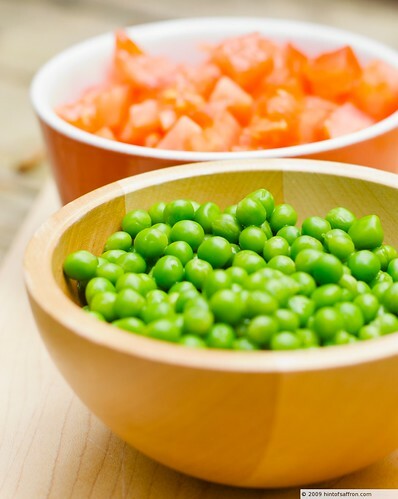 There is an amazing and fantastic variety of dishes that come under that umbrella. They are lip smackingly tasty. If you ever been to Bombay (or Mumbai as it is called now), you will notice an array of food places on the streets. They range from Pani Puri (puffed puri with a spicy tamarind broth), Bhel Puri (crushed puris with garbanzo beans, yoghurt, chick pea flour noodles, tamarind and mint chutneys), Samosa (spicy potato and peas wrapped in a wonton wrapper and deep fried), Pav Bhaji, Pakoda and many others. Growing up in India, I remember eating these foods. My mom wouldn’t let me eat these foods from the street vendors due to bad hygiene. 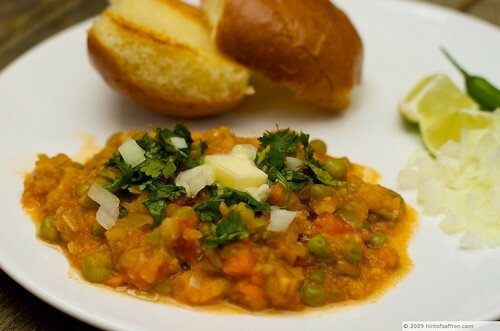 One of my favorite dishes was Pav Bhaji. We would visit my favorite restaurant that had an open kitchen. I was fascinated with the speed at which the cook made the Pav Bhaji. He would create this dish right in front of you in a pan nearly 4-5 feet in diameter. He had all the chopped vegetables and big containers of spices placed on the side of the pan ready to be cooked. He added handfuls of various spices and fry them with the onions and herbs and vegetables and cooked them till they were done and all the spices were mixed in with them. He would mash some of the bigger pieces of the vegetables. Then he would add butter on the sides of the pan and fry the buns till they were lightly browned. One by one he would add the Bhaji (cooked vegetables) to the plates, along with the fried buns along with a handful of red onions, lemon and cilantro. He added a spicy chutney on the side. He did all this with amazing speed. I would dig in and wouldn’t stop till I finished the whole plate clean! Yum!! This will be one of many recipes to come where you can prepare these foods at home. Over the years I have cooked lots of the above mentioned dishes and they have been a big hit among my family and friends. Even though it has quite a few ingredients, it is quite an easy dish and incredibly tasty. 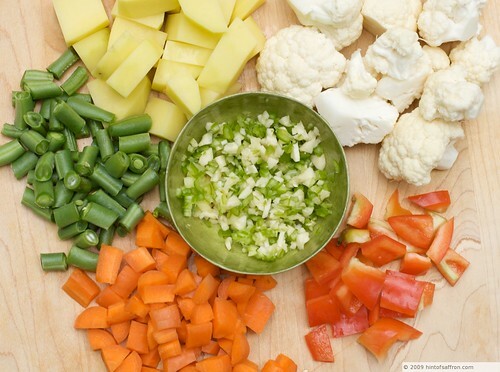 It is a matter of frying all the vegetables, herbs and spices together until they are cooked really well. Then adding the pav bhaji masala and let the masala seep through to the cooked vegetables. Serve it with onions, squeeze of lemon on the vegetables and a little chopped cilantro drizzled on top. Eat it with the buns or french bread. Here is the finished recipe. You usually serve it with onions, wedges of lemon and cilantro. This is an incredibly tasty dish. Just make sure to chop the vegetables really small. You can substitute oil instead of butter or ghee but it might not taste the same. Instead, use a lesser amount of ghee. You can buy the pav bhaji masala from an Indian grocery store or from the link provided in the online store. In a medium pan, add the onions and fry them in ghee till golden brown. Add chilies, ginger and garlic and fry for 1-2 minutes. 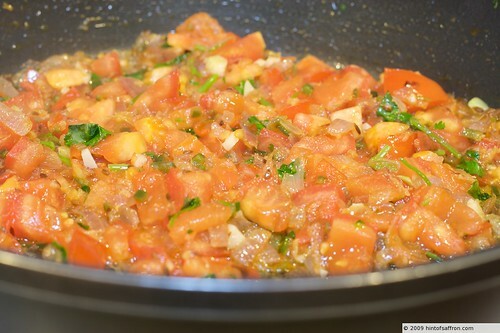 Add tomatoes and fry till they are softened. 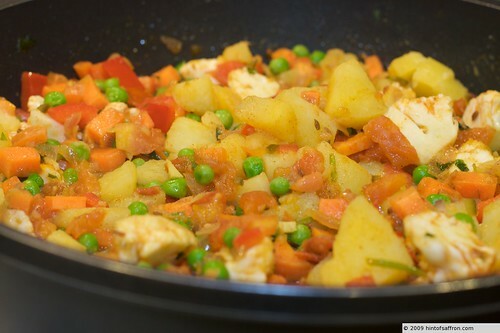 Add the cooked potatoes, peas, bell pepper, cauliflower and carrots and make sure the tomato and herb mixture covers the vegetables. Cook till all the vegetables are soft and cooked stirring occasionally. Add the pav bhaji masala and salt to taste and stir well. Let it cook for 3-4 minutes. Melt some butter or ghee in a pan and fry the sliced bread or rolls till they are light brown. Or lightly toast the breads and brush ghee or butter on them and serve. Serve the vegetables with the bread, chopped onions, lemon and cilantro.